Ever wanted to convert your Sherline CNC Machine to USB. I sure did. Why be locked into a specific PC to run your CNC machine. I'm a Linux fan, but I know there are also many people who like Windows and Mac OS X. Free me from the parallel port and proprietary software that runs my gcode file. 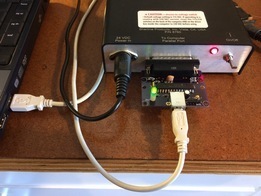 Here is a picture of the rt-stepper dongle plugged into a Sherline CNC controller. The USB cable is plugged into a notebook with no parallel port. The software that drives the rt-stepper dongle is pymini. Yes it's written in python, so it runs on the three OSs. Software is based on EMC2 (linuxcnc), but without the realtime Linux kernel requirement. I'm running pymini with the sherline.ini file which is pre-configured for a Sherline machine, so no stepper motor tuning procedure is required. All the software is open source and available at www.ecklersoft.com. Here is a video of the hardware running with no video speedup, so you can actually see how smooth and fast the Sherline machine runs using the dongle.